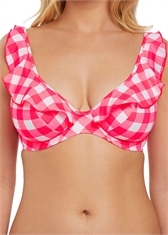 Complete Freya's Totally Check swim collection with the bikini brief co-ordinate, featuring an oversized gingham print in a vibrant tropical punch colourway. The flattering shape offers good coverage and sits perfectly on the hips. Available in sizes XS-XL.